Applying the same principles as “Good Idea, Bad Idea,” here are a few examples we’ve thrown together for media strategists and content marketers. There’s a fine line between posting on social media and overwhelming followers. Stick to a publishing schedule so your content surfaces when your market groups are active on Facebook, Twitter, and other platforms. Mix up your posts by striking a balance between entertainment and information. The prospects of such a thing are daunting. Friends would be sharing you all over the place and would like every second of it. What would be worse? Being fed to a newsfeed and never being liked, shared, or even noticed. Blogs are highly searchable, uniform, and easy to turn into a pseudo-homepage. Company-operated blogs should have everything from contact info and links to fresh content and easy media opportunities for quick shares and likes. Who would ever see it? No one. Most people stumble onto websites and avoid the “blog” section and are instead routed there through outside sources. Not only are blogs effective, they are easy to use and easy to share on social media. Use social media, blogs, and websites to inform your clients and followers. They follow you because they are interested — don’t let them down. Sounds like a hostage situation. Put in marketing terms, this is when a media manager tries too hard to force one-on-one conversations. Don’t push too hard or else you might lose more than an existing follower. Websites are an online marketer’s primary hub of activity. It’s where social media, content, and other assets come together. Building up an active website takes time and a bit of investment, of course, but it’s never too late to simplify navigation, cut down on slow-loading images, and write up some fresh content. Sounds like a self-replicating machine, though any website with the ability to redesign an actual person is a terrifying thought. Still, it would be nice to hit the “home” button and wind up on the front lawn. Farm your followers, commenters, and business networks for content ideas. This creates more hype from a reader’s perspective and is a great way to break out of a slump. When in doubt, ask your fans on social media what they want to read about. What a dismal end for a content writer. Without monitoring the success of blogs, posts, and other assets, not to mention outright ignoring comments, a blog or media account has no chance of drawing in business. Tweet away all you want as long as your 140-character messages are informative and entertaining. You can also use Twitter as a way to advertise deals, discounts, blogs, and new releases. Nothing kills off Twitter followers like saying something arrogant or wrong. Avoid posting anything that is reaching too far (e.g. tying your craft business to a pop star) or controversial. You have resources and need to use them. Only have 100 Facebook fans? Find out what others are doing and apply similar principles to your own campaign. As a side note, it is helpful to stay up with content trends by paying attention to popular blogs and marketing websites. What more can you say? You’ve extended the possibilities, are out of ideas, and no one is reading your blogs or sharing your content. Branch out. 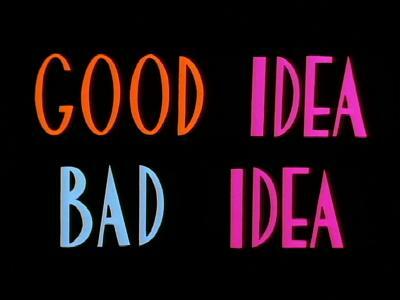 And there it is, our short rundown on “Good Idea, Bad Idea: Marketing Edition.” There are countless little quips to consider, though like most successful marketers, we understand the golden rule of content: Too much is asking for trouble.